I would like to express my greatest gratitude to you for giving us your best support.Today, our group, Aung Gabar Company Limited, is a highly diversified enterprise. We pursue boundless dreams by accepting challenges that others timidly avoid. We believe that a strong will can make dreams come true, and that limitless effort can overcome any obstacle.These beliefs from Aung Gabar history remain the driving force behind our growth. We aim to become a creative company that grows continuously throughout the future. Aung Gabar Group employees who have adopted this challenging spirit personify our path to growth. 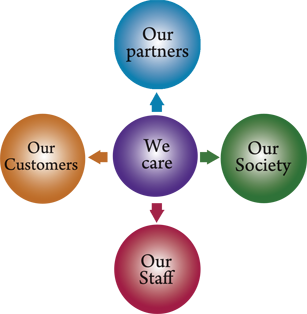 All our employees will provide differentiated service and solution to truly satisfy our customers. Through innovation and effort, we will improve the value of our investors through endless and efficient business management, and we will show our confidence and infinite potentialities. We will continuously build the precious future of our customers. Our Philosophy … What ? During our first decade of company’s establishment we’ve proved that we are able to develop profitable and market-leading businesses in Export, Import and Distribution. Our Company was established in 1989 It was the year Government had declared its Economic Policy as “Market Oriented Economic Policy”. We have already proved that we can expand our business in Distribution of International various kinds of Hoses and Pipes… Most of those hoses and pipes are now well accepted by regular buyers, government buyers in markets nationwide of individual including corporate buyers. Our Head office is in Yangon and branch offices are in Mandalay , Muse (Border Town) and Shwe Li (China). Our company had been certified that ISO 9001-2008 quality management standard in August 2010 and ISO 22000 Food safety management standard in February 2011. In the future, we plan to add the most competitive price to that quality by setting up additional facilities to serve our customers. With reliable quality, we are always trying to win our customers’ trust and confidence. 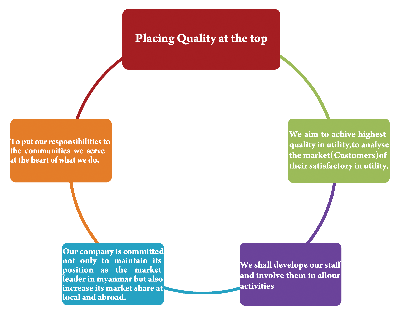 Our company is continually establishing specific, measurable quality objectives consistent with the quality policy. These objectives are periodicallyreviewed and updated,as necessary, by the General Manager and Management Review Team and communicated to the organization. Review process is normally conducted at least once every year. The Management of the company strongly believes in total customer satisfaction. Systems are in place to ensure that customer requirementsare met and the extent to which the customer is satisfied is monitored and measured with the aim of continuously enhancing customer satisfaction. Top Management reviews the continuing suitability, adequacy and effectiveness of the quality Management system at planned intervals. The objective of these reviews is to find possibilities of improvement in quality management system and also how to enhance the business and to improve the products and services. The critical equipments used in Processing and storage process are Moisture meter, Digital and Analogue Platform scale etc,; The devices required for calibration according to the usage.All devices being used by the quality inspectors, production and distribution staffs are properly calibrated by third party agency. In 1995 a Joint Venture “Dragon Bond International Co., Ltd.” was formed by AGB and Material Supplies Pte Ltd. of Singapore. This JVC render sales, rental service of heavy construction vehicles and equipments to construction works. Material Supplies Pte. Ltd. (Singapore) also appointed AGB as the business representative of Myanmar for their products. In 1997-98, AGB imported compound fertilizer from china and distributed as sole agent in Myanmar. Manufacturing and distribution of AGB Hose Pipes (Water discharge hose, Flexiblesuction hose, Braided hose) for use of agricultures, minings, constructions, common water supply drainages, shower hose for gardenings, fire tinguisher hoses, etc..
Again in the year 2003 a Joint Venture Co. was formed between “AGB” and “Arena Services Pte. Ltd.” of Singapore. In 2009, we hired. “Peoples Park” from Yangon City Development Committee to make amusement park for people. This was named Natural World Company Limited which we also have shared in that Company. A Joint Venture was formed with Arena Services Co., Ltd. to produce GRP Pipes in the year 2010 with the help of Chinese experts and technicians. The pipes were supplied to Yangon City Development Committee to use in water supply and also have been distributing Naypyitaw and Mandalay divisions since 2011 . Manufacturing of Arena Fibreglass Watertank & Arena Fibreglass Household products (Fibre boat, Fibre Seat, Fibre Dust Bin, Fibre Plain Sheet etc) had been started at Oct 2011. Aung Gabar Motor Services Co., Ltd was registered and opened car show room sales centre in the year 2012, with the permission of Minister of Trade. Vehicles and cars were imported from Japan, And by consignment basic with s’pore. We import round about 2000 cars from others countries such as Japan, UAE, USA and Germany, etc. At present demand, we focus our sales will reach about nearly 1800 cars in current year. We make a joint venture with Japan company for import cars from Japan to Myanmar. This joint venture opened three car showrooms in Yangon City. The head office was opened in No (108), The corner of Kabar Aye Pagoda Road and Nat Mouk Road, Bahan Township, Yangon. 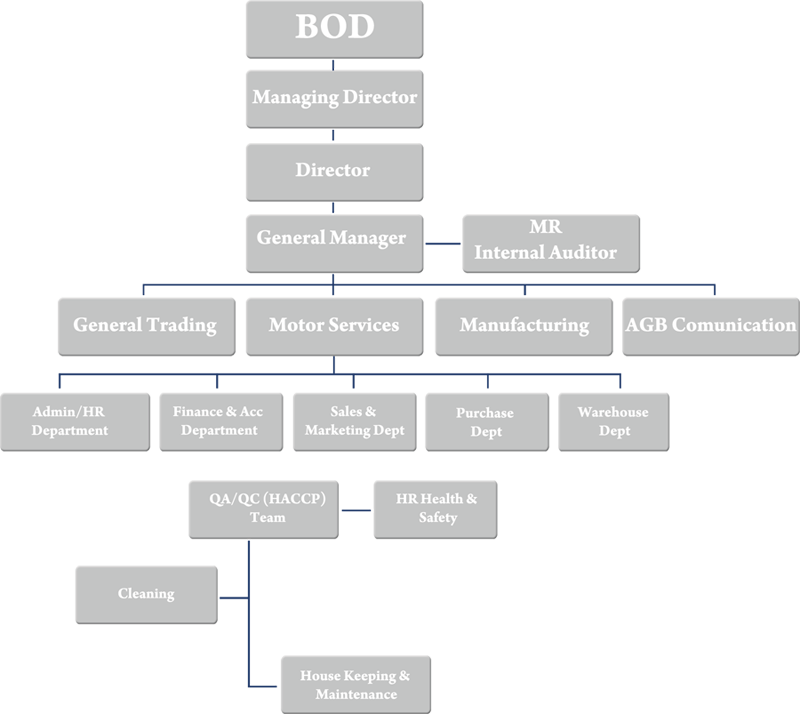 This joint enture is appointed about one hundred staffs, specializing in the field of management, accounts, sales & marketing and technical personal such as mechanic and drivers. The production and distribution of PPR Pipes(Polypropylene Random Copolymer)have been started in 2013. PPR pipes are the Chilled Water (Cold Water)&(Hot Water) pipes and can be used in Buildings, Constructions and Home etc. In 2013 February, we also make as sole agent distributor of Yasung Co., Ltd from Korea for imported “Pony Water Discharge Hose Pipes” and supplied all divisions in Myanmar. We had been established Aung Gabar construction company limited in 2013.Now we are starting construction activities in Yangon City. We also have been doing joint venture with Material Supplies Co.,Ltd, Singapore, to import Binotto Hydrolic Cylinder from Binotto, Italy since April 2013 and sale for Government project tenders and local market. We have been importing Hooklift from SUCCI-LIFT, Italy as sole agent since June 2014 and distribute for Government Tender and local market. 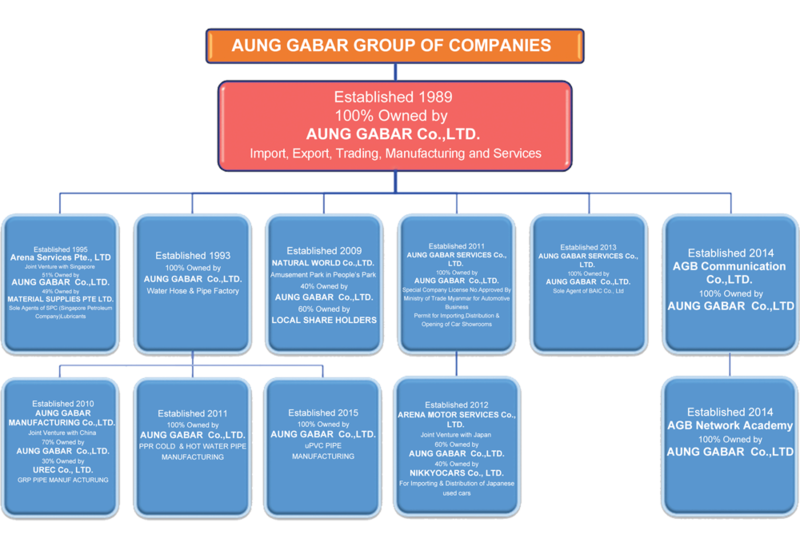 In 2014, Aung Gabar Group Of Companies set up AGB Communication company limited. We are planning to provide telecommunication services such as; international gateway services facilities, internet Service Provider Services, IPTV Services, VOIP Services, Data Centre Services and Value-added Services. Aung Gabar Co.,Ltd is also Sole Distributor of Sing Oil lubricants from Malaysia since August 2014 and sell in local market. In October 2014, we started to manufacture new pipe line system called HDPE water supply pipe and have been distribution in Local areas. The pipe sizes are available from OD20mm to OD160mm and they can be used long-life over 50years. Aung Gabar Co.,Ltd has been doing joint venture with Thirilinn Co.,Ltd to do business of Golf Carts Rental, Sale and Trade-In service for Pun Hlaing Golf Estate since September 2014. Royal Precision Lubricants – We, Aung Gabar Co.,Ltd, import “Royal Precision Lubricants” from WBF Pte Ltd, Singapore as Sole Agent for myanmar market in this year. uPVC pipe systems – We are planning to manufacture uPVC pipe systems and will distribute all divisions in July 2015. The Group has a workforce of approx. 400 people. Office group 200 persons, Factory group 200 persons.